After devastating northwestern Pakistan, floodwaters traveled down the Indus toward the coast in early August 2010. The river overflowed into its floodplain in Punjab and Sindh Provinces as authorities evacuated thousands of residents in Sukkur and other cities. The Christian Science Monitor reported that the floods had affected up to 12 million people, killed more than 1,600 residents, and destroyed or damaged more than 600,000 homes. With monsoon season only halfway over, the floods had already caused more damage than the 2005 earthquake. 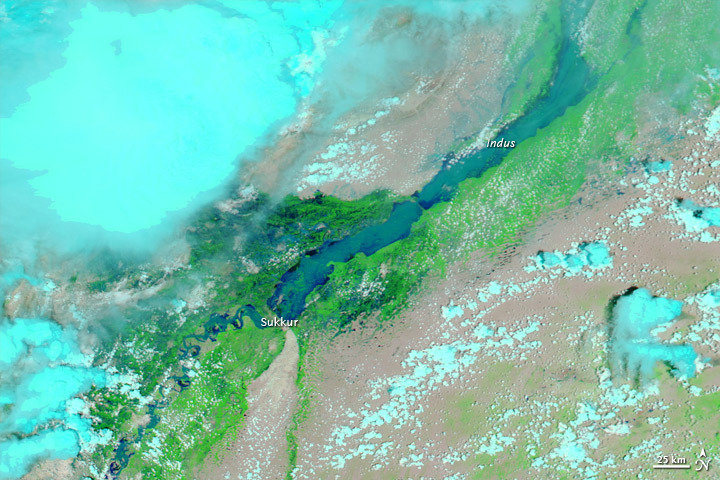 The Moderate Resolution Imaging Spectroradiometer (MODIS) on NASA’s Aqua satellite captured these images on August 8, 2010 (top), and July 18, 2010 (bottom). 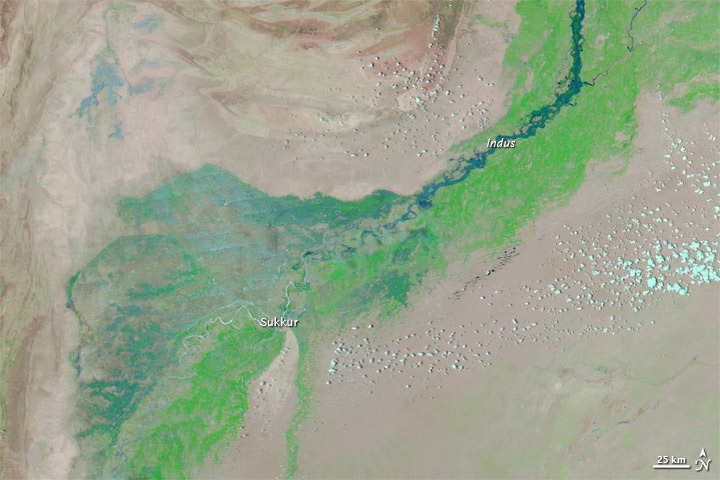 The images show the lower Indus River, not far from Pakistan’s coast. Both images use a combination of infrared and visible light to increase the contrast between water and land. Water appears in varying shades of blue. Vegetation is green and bare ground is pinkish brown. 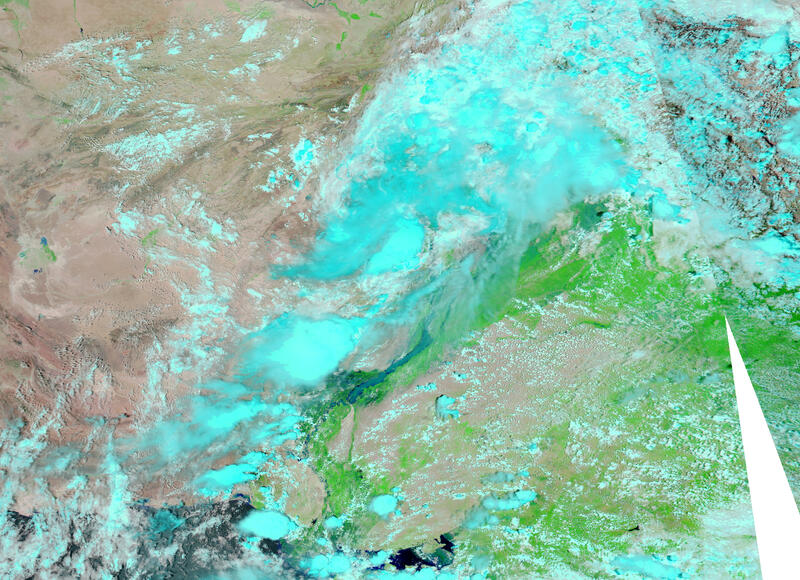 Clouds range in color from pale blue-green to bright turquoise. The difference between mid-July and early August is dramatic. On July 18, the river is a braided stream that almost appears to peter out toward the southwest. On August 8, the river fills the river valley, merging the braided streams into one swollen, raging river. The river narrows near Sukkur, but even to the south, water levels are clearly higher than they had appeared weeks earlier. 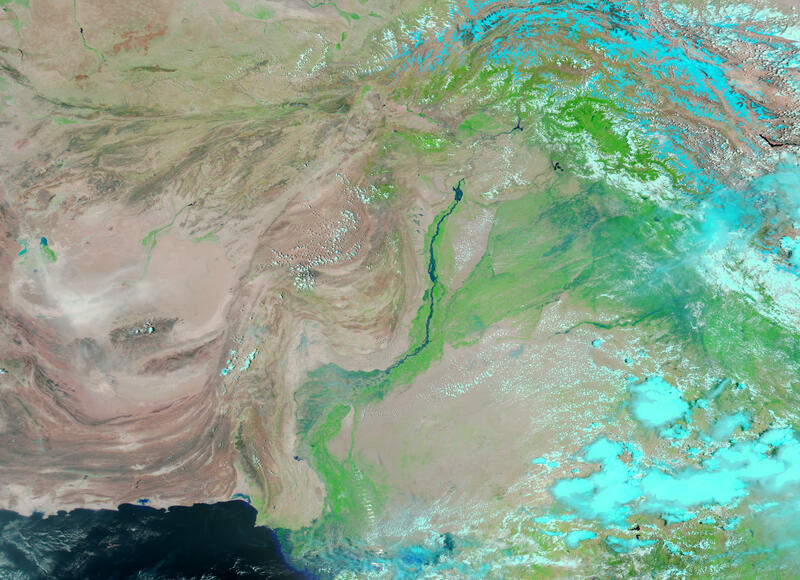 Acquired on August 8, 2010, and July 18, 2010, these false-color images show a dramatic difference in water levels along the southern extent of the Indus River, midway through Pakistan’s monsoon season. Barnes, T. (2010, August 8). Pakistan floods now worse than 2005 earthquake, say officials. The Christian Science Monitor. Accessed August 8, 2010.